WE WORK ON A SCIENTIFIC BASIS! THROUGH THE SPECIAL COMPOSITION OF OUR MEALS, SATIATING HORMONES ARE RELEASED OPTIMALLY, HUNGER IS OPTIMALLY LIMITED, AND FAT BURNING IS ACTIVATED TO THE MAXIMUM. KETOGENIC, LOW CARB OR MODERATE-CARB. After ordering, you will receive a survey. As soon as you have entered your information, it will take 7-10 workdays, and then you will have your meal plan! We adjust all plans personally to your need for calories and macronutrients (carbohydrates, proteins, fats) so that you can reach your goal optimally! Foodpunk – for maximum efficiency! The detailled planned nutrition optimizes your metabolism and puts your body in fat burning mode. 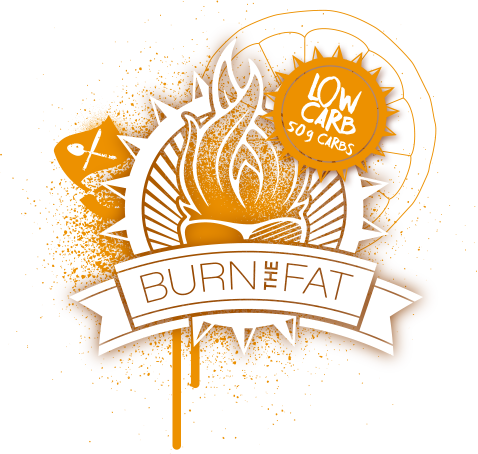 The BURN THE FAT Challenge is carb-reduced. Each day, 50 g in carbohydrates will be on the menu. For this reason, one can call this Challenge LOW CARB. Fewer carbohydrates do not necessarily mean less enjoyment or fullness, however. If the meal plan is put together correctly and perfectly fitted, you will always be full and satisfied after a meal. All of our meal plans are structured in a way that optimally stimulates satiating hormones. 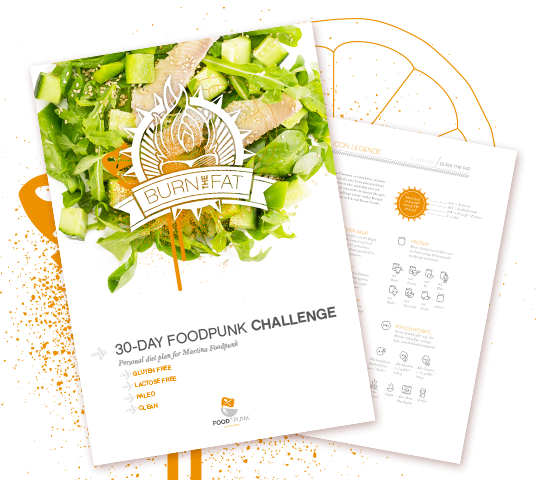 The BURN THE FAT Challenge is exceptionally well-suited to burning fat and beginning a LOW CARB diet. However, you can also maintain weight, work on your fitness, or build muscle with this plan. The amount of carbohydrates is just one component. With the amount of protein and the total amount of calories, we can tailor the plan exactly to your goal. If you don’t know which plan is right, then just leave the decision to us. In the survey after the order, you can either decide on a plan – or we’ll find the perfect plan for your goal. This is then modified and calculated further, and then exactly adjusted to fit you. Questions? Just start a chat or send an email to info@foodpunk.de. The decreased amount of carbohydrates leads to a change in metabolism. Only little insulin is released after meals, the fatburning mode is not interrupted. A sufficient break between meals helps to continue training the fat metabolism. After the initial stage of transition, you will be fitter and perform better than you can imagine. This is because we eliminate all energy thieves from your diet – the ones making you tired and groggy – including gluten, additives and antinutrients. Instead, your body is optimally supplied with vitamins, minerals and trace elements. The plan is lactose-free, gluten-free and soy-free. This eliminates the worst allergens from your diet. Together with the optimal supply of nutrients, this gives you radiant skin and a fresh appearance. With this new energy you will radiate and glow from within. In the metabolic state of ketosis your brain is fueled by ketone bodies. Say hello to razor-sharp focus and goodbye to afternoon crashes. and use the full capacity of your brain! 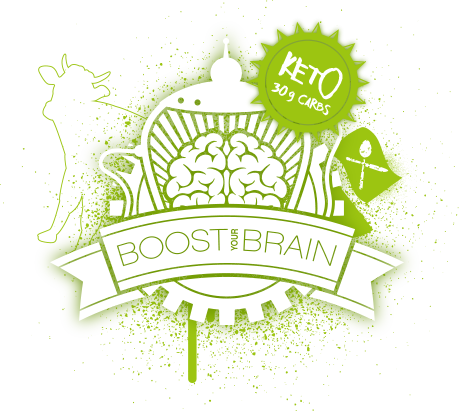 The BOOST YOUR BRAIN Challenge is the ketogenic version of the Foodpunk Challenge. At a carbohydrate level of 30 g per day, your metabolism will switch to ketosis. Ketone bodies will be produced and supply your brain with effective energy. 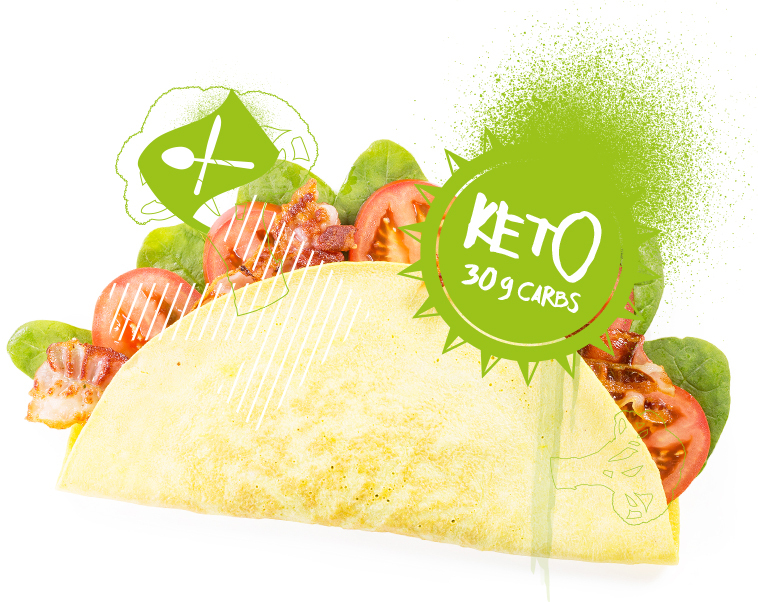 The meals are put together in a way that perfectly prepares your body for ketosis. The exact amount of carbohydrates causes your metabolism to make a 180-degree turn. You will transform from a sugar-burner into the ultimate fat-burning oven. The high rate of fat burning will lead to the formation of ketone bodies in your liver. Ketone bodies are water-soluble and reach important organs through the blood. The brain and heart muscles benefit the most from this great source of energy. We named this Challenge the “BOOST YOUR BRAIN” Challenge because it most strongly optimizes your brain metabolism. At the same time, you can also burn fat and lose weight in the ideal manner with this Challenge. Obese and overweight participants in particular will experience a quick loss of fat with the BOOST YOUR BRAIN Challenge. Participants of normal weight will usually lose the last few unwanted kilos most easily with the BURN THE FAT Challenge. 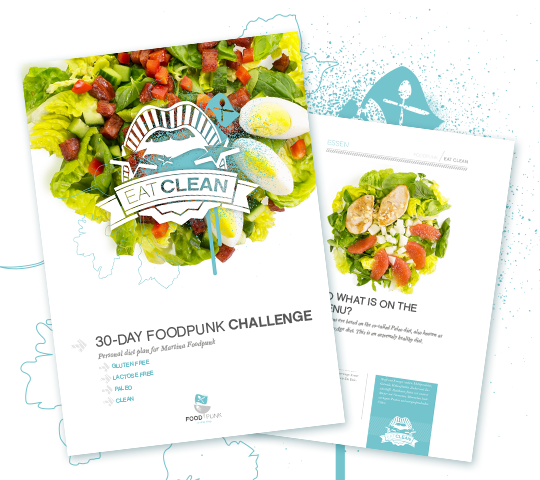 People who are in shape and of normal weight will benefit from the EAT CLEAN Challenge. But don’t worry, you don’t have to decide beforehand. After registration, we can use the information you provide to decide which Challenge is perfect for you and your goal. Something’s not clear? Just start a chat or send an email to info@foodpunk.de. You will become independent from carbohydrates, sugar and quick snacks. Your brain no longer gets its energy from glucose, but from ketone bodies. These are made from fatty acids, which you always have with you. The result is a steady, uninterrupted supply of energy to your brain. With this Challenge, only a minimal amount of insulin is released after a meal. The carbohydrates, proteins and fats in a meal are balanced with each other in a way that will satiate you optimally, thus ideally stimulating fat-burning hormones and enzymes. Ingenious training for the metabolism. When the concentration of ketone bodies in your blood increases, you enter ketosis. Your brain then is trained for the intake and use of ketone bodies. The better trained it is, the higher your brainpower. At the same time, ketone bodies have a satiating effect. Great, right? ATTENTION: Ketosis is not the same as ketoacidosis. Ketosis is positive! Better muscle building, competition preparation, general fitness or high definition of the body? With our EAT CLEAN Challenge, you’re on the right path! 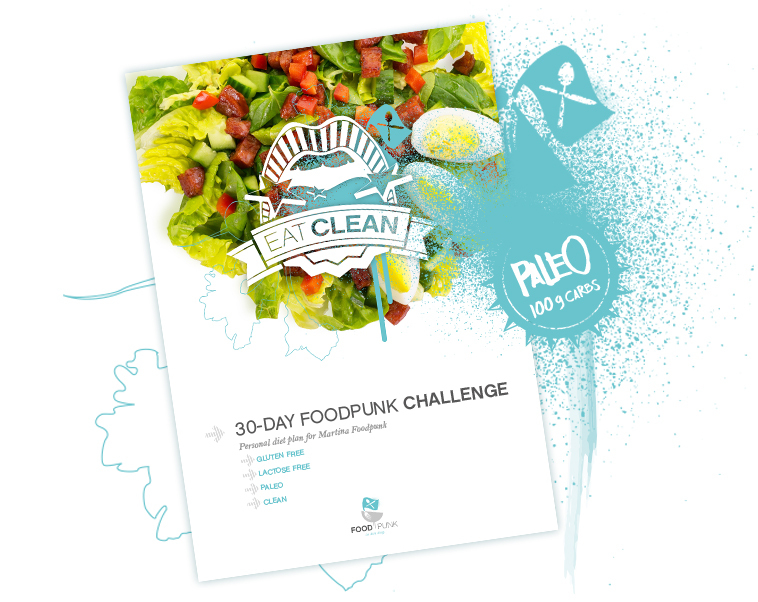 We also call the EAT CLEAN Challenge our PALEO Challenge. In general, all of our plans are compatible with the paleo diet – they’re free of dairy products, legumes, sugar and additives. Unlike the BURN THE FAT and BOOST YOUR BRAIN Challenges, the EAT CLEAN Challenge isn’t LOW CARB. Crossfitters, weightlifters and healthy people of normal weight will also benefit from healthy carbohydrates. Also, for those who aren’t ready for low amounts of carbohydrates, this Challenge is the perfect first step. It offers a wide spectrum of starchy vegetables like sweet potatoes or pumpkins, and a larger selection of fruit. 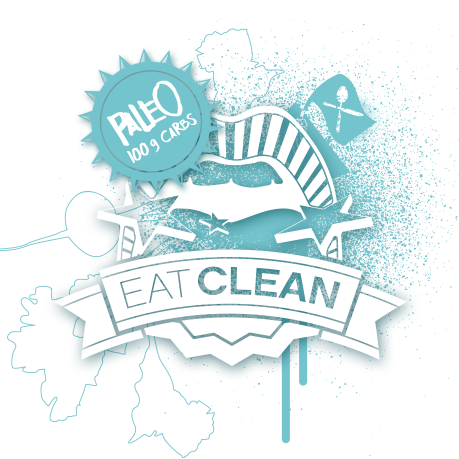 Those who want to live healthier, get rid of allergies, improve digestion and their general well-being will be in the right place with the EAT CLEAN Challenge. Too big of a selection? You need help? Just start a chat or send an email to info@foodpunk.de. While bananas, for example, are avoided during LOW CARB Challenges, they are part of the meal plan here. Other types of fruit and high-carb vegetables are found in larger quantities here. Not everyone wants to lose weight, not everyone wants to enter ketosis. With the EAT CLEAN Challenge, you will experience all of the benefits of a natural, balanced and additive-free diet without the metabolic adjustment that can sometimes make you tired at the beginning. Fit people of normal weight who are looking to get rid of the last 2-3 kilos can especially achieve this very well with the EAT CLEAN Challenge. Not just the amount of carbohydrates decides whether one can lose weight. We can also use the amount of overall calories and the protein content of your plan to optimize your Challenge to your goal. You aren’t sure which plan to choose? We’d be happy to have you leave the decision to us. After you order, we look at the information you entered in the survey, and we decide which plan fits you and your goal the best. Afterwards, that plan is continuously measured to fit your personal needs. All recipes have been tested and improved multiple times. The highest degree of enjoyment is guaranteed. You don’t need to do anything but cook and eat. The core of the Challenge is a meal plan adjusted to you. It contains 90 recipes – 30 x breakfast, 30 x lunch, 30 x dinner. Every single recipe is adjusted to fit your energy needs as well as your need for carbohydrates, protein and fat. If you’re very active, you’ll also get suggestions for simple snacks between meals as well as before and after your workout. The composition of the meals is of the highest priority during the Challenge. We focus on recipes that make you healthy, fit, and bring you closer to your goal. BUT: Enjoyment cannot be neglected under any circumstances. We promise you, both are possible. Eating healthy and feasting. With the recipes from Foodpunk, losing weight can be child’s play for you! They contain the perfect amount of carbohydrates, protein and fat. The goal is to optimally stimulate satiation hormones, lessen hunger, and make losing weight easier. Because it isn’t just about the number of calories, but also about the exact composition of meals. But don’t worry: We’ll do the work for you. You don’t need to do anything but cook and eat! No headache! Of course, you can also pick building muscle or general fitness as a goal – it doesn’t always have to be losing weight. Before we adjust your plan to you, you will receive a survey in which we address such issues. We have already accompanied numerous people on their way toward a healthier, skinnier and more fit life. 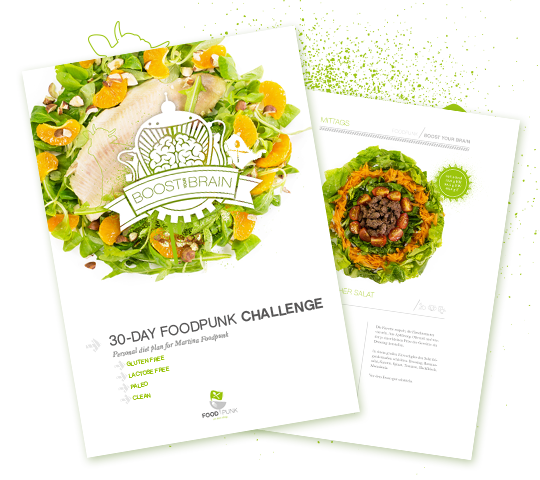 We combined all of the knowledge from the study of nutritional science, , from working with customers, and from our personal experience with the Foodpunk Challenge! The recipes for lunch are ideal for on-the-go, and the recipes for dinner are warm, cooked meals. For breakfast, you don’t need longer than 5-10 minutes. You can exchange all recipes completely free. You can exchange every breakfast for every other one, every lunch for every other lunch, and every dinner for every other dinner. In addition, you can exchange the recipes for lunch and dinner. For example, this means you can cook twice as much in the evening and take the second half with you for lunch the next day. Many participants cook multiple portions of 3-5 selected dishes on Sunday, and then only need to warm them up during the week. Through the Facebook group, we remain in constant contact. This way, we can answer all of the questions there as quickly as possible. Former and current participants are glad to assist you in word and deed. In the morning, you’ll receive a daily email with background knowledge, helpful tips, or motivation. 1-2 times a week, there’s a live round of questions on Facebook. Viewers can write messages and we’ll answer live on camera. The round of questions takes place in the evening in order to give as many as possible the chance to participate. I’m not telling you when to do what kind of exercise. Instead, I adjust the meal plan to your activity and your training, since each person has different preferences. I’ll be glad to give you tips for training – whether beginner or advanced-level. A little movement will do you good and will support your goals, but you don’t have to exercise. Because if you want to lose weight, your success primarily depends on the right diet. If you want to build muscle, however, you will need to do regular strength training. But I bet that you’re already in the middle of that. Our internal Facebook group is growing and growing. The exchange is great. Here, experienced Challengers meet beginners. The old guard is passing its knowledge on, and many of them are going for another round themselves. Members consistently support one another in word and deed. It doesn’t matter what’s on your mind. You can’t find an ingredient? Are you having some trouble? Do you need some tough love? The community is there for you! Even we – the founder and nutritionist Marina Lommel and the Foodpunk Team – are a part of the community and we’ll get through it together with you, as we’re taking the Challenge as well! Marina supported me very much with her meal plan. The recipes are delicious and easy to understand, and ingredients are easily exchanged. Perfect for me! Losing weight without being hungry was a foreign concept to me until now. I’ve already tried quite a lot in order to get rid of the remaining pregnancy kilos … but Foodpunk is really fantastic.